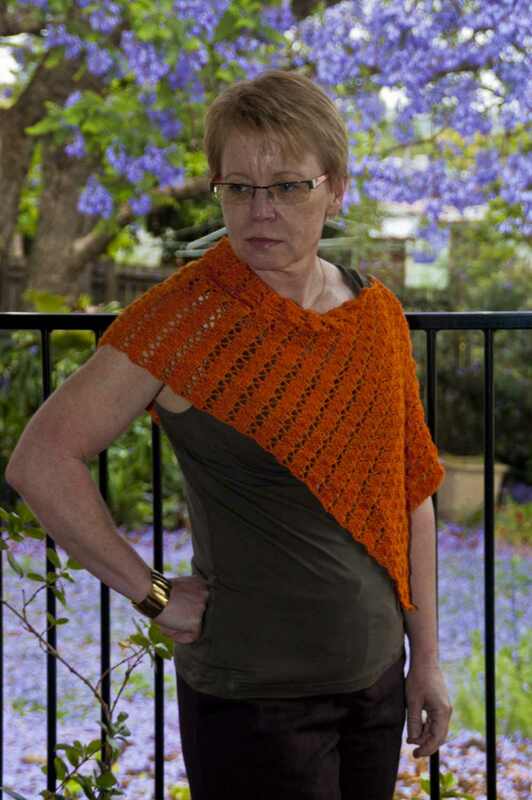 I have finished some crochet to show you - the pattern is City Chic designed by Jenny King. 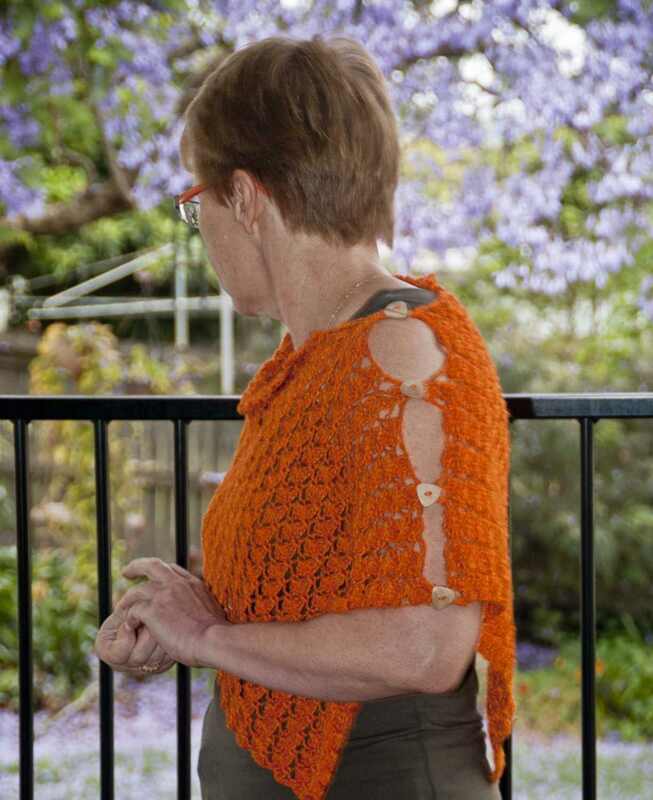 For those who are on Ravelry.com, you can find the project details here. 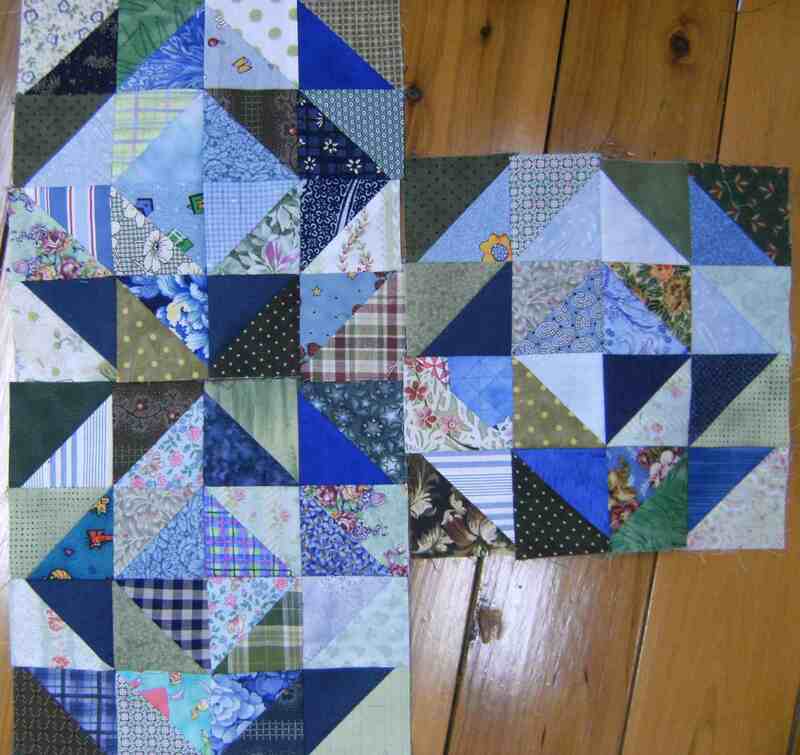 As usual, with JK Designs, I found that my item is much smaller than the ones pictured in the pattern. Jenny King crochets very, very loosely so please take this into account if you are making her patterns up. 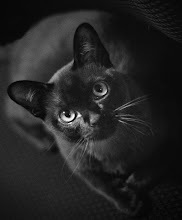 However, saying all that, I am not disappointed and still love my little poncho. It was perfect to wear on a cool, showery day and kept me comfortable. I like the buttons that hold it together on one shoulder - they add a nice touch. You may be wondering what is the purple haze in the background of these shots. 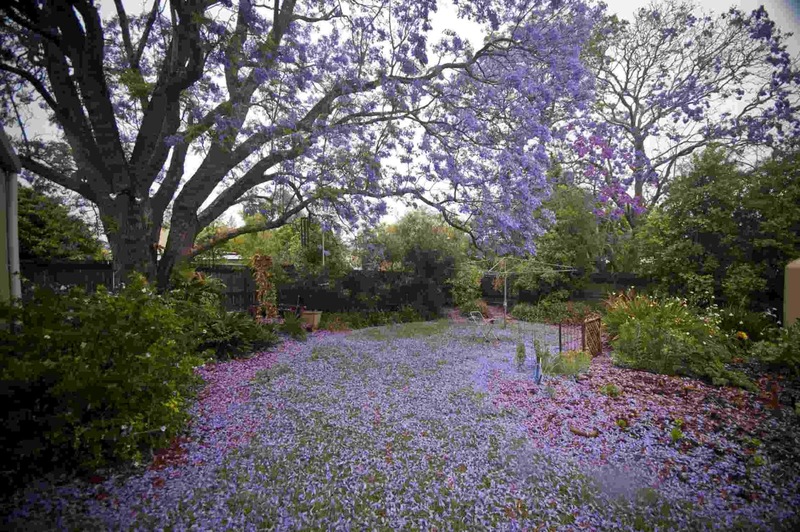 The pictures are taken on my back deck overlooking the Jacaranda tree in the back yard. I think I fell in love with this house as I wanted the tree! 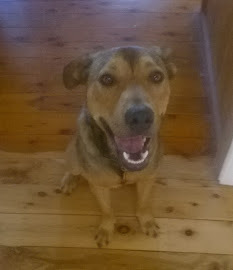 My blogging is slow at the moment as I am not making heaps of clothes at the moment. I have got into a scrap quilt project and it is consuming my sewing time at the moment. Love your little poncho Sue. 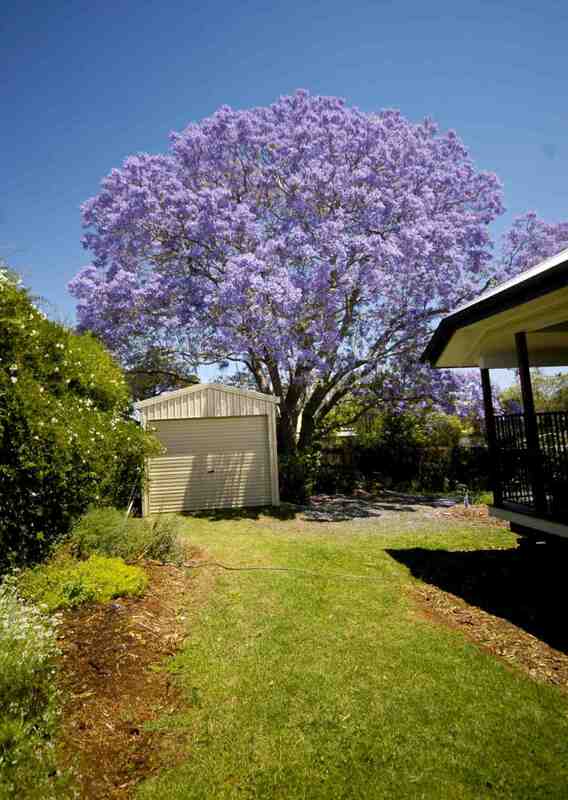 And the jacaranda! My mother has 3 in her front yard. I will always remember the time I got a bit of a flower in my eye as a very young child (how I have no idea!) and had to visit the dr.
That jacaranda is just gorgeous...I had forgotten about jacarandas at this time of year. Such a beautiful colour. 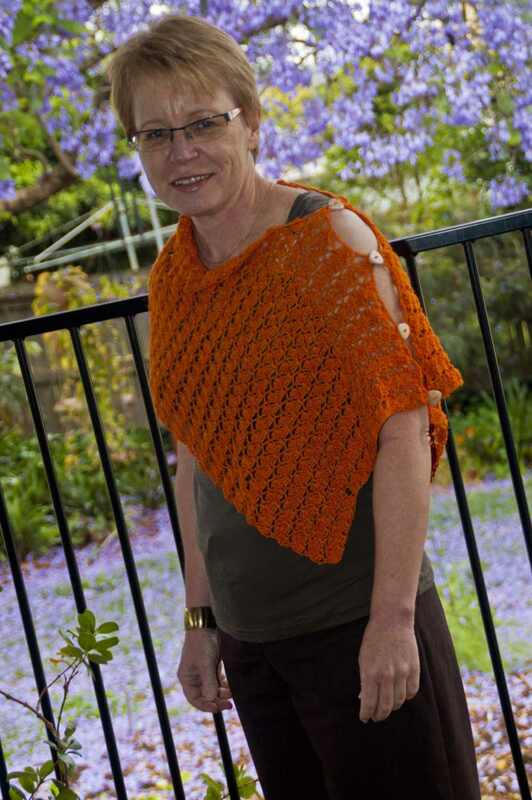 Very cute poncho and perfect colour. Great poncho, very stylish. Love the color too. 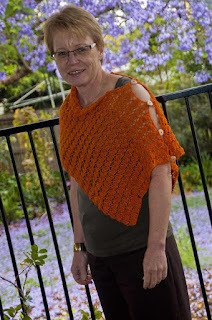 Beautiful job on your shawl! 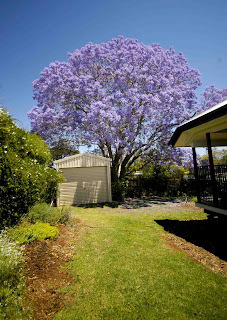 I have a jacaranda tree too. They really are gorgeous! 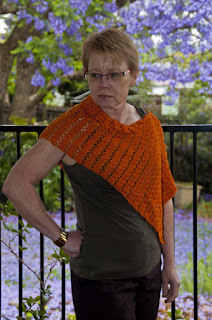 Love the bright orange color--just the thing for keeping warm! What a beautiful crochet stitch! 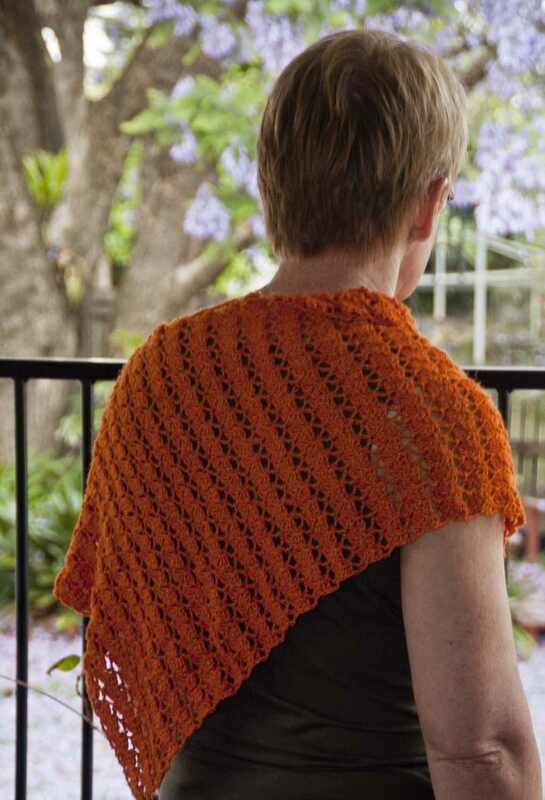 I love the shawl in that color. No wonder you bought that house that tree is magnificent! Sue, I love your poncho, your tree and your scrap quilt. Wish I had time to do some crochet, it is such a fun thing to do. The orange colour is great. Oh Sue that is very pretty. Gee I really need to get into crochet ... I can do it but I've never read a pattern and this and Lina's Land lacy crochet. 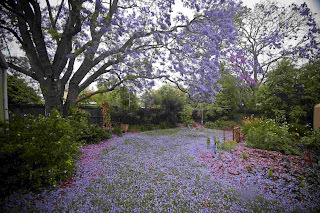 The jacaranda are SO beautiful and true to what they say, when the jacaranda's bloom the uni students are doing their exams!